Anna had been working on it for some time, but it became a collab during the last week. I helped her a bit with it. Whenever she got tired, I would take control. For example, I made a super detailed vector of the girl's cellphone (it doesn't show, does it? ), drew some of the fluffy clouds, the rainbows on the left side and coloured most of the popart. Anyway, collaborating was actually weird. We had a hard time, but it was really fun and we're both liking the result. We both hope you like it and of course, we would like to see your comments! EDIT: Thank you so much for the highlight! This is something you NEED to full-view. The fabulous vector work, the awesome colors and the touch of texture are just part of the wall. Take a good look at the details in the background. The graffiti, the colors used, everything right down to the cracks in the wall is fantastic. its from animepaper, i asked those two to upload it here! i knew this is going to be highlighted! See what i told you! Ah yes, I remember this awesomeness from AP. Lovely work! Yep, when I saw the thumbnail here, I knew it would be highlighted ;) And it's well-deserved. Finally, the awesomeness has landed in our humble abode! And yes, I see the cell phone. It looks great. I can't believe it's vectored. An amazing wallpaper. I love the variety of color. 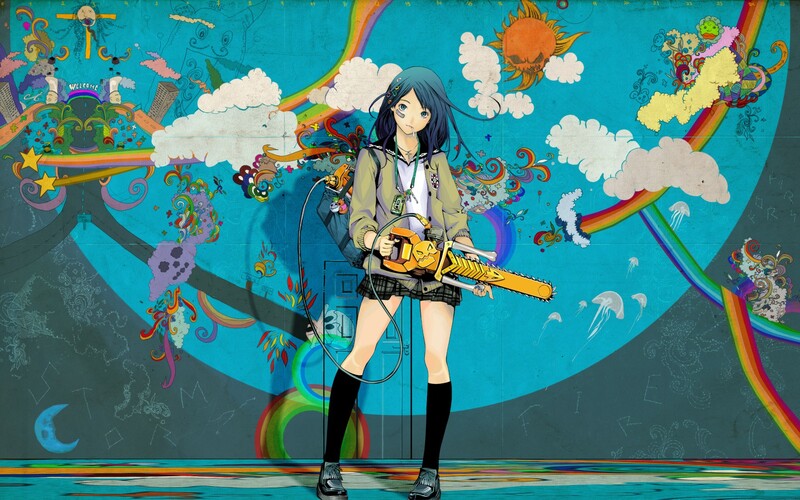 The color juxtaposes well with the chainsaw girl. Wow, the effort both of you have put into this vector-wallie is awesome. Congratz for the highlight, you deserve it! The variety in color, the chainsaw-girl and your vector girls turn this vector into a flawless piece of wonderful art. It's a very good job! I love it , the variety of colors it amazing!